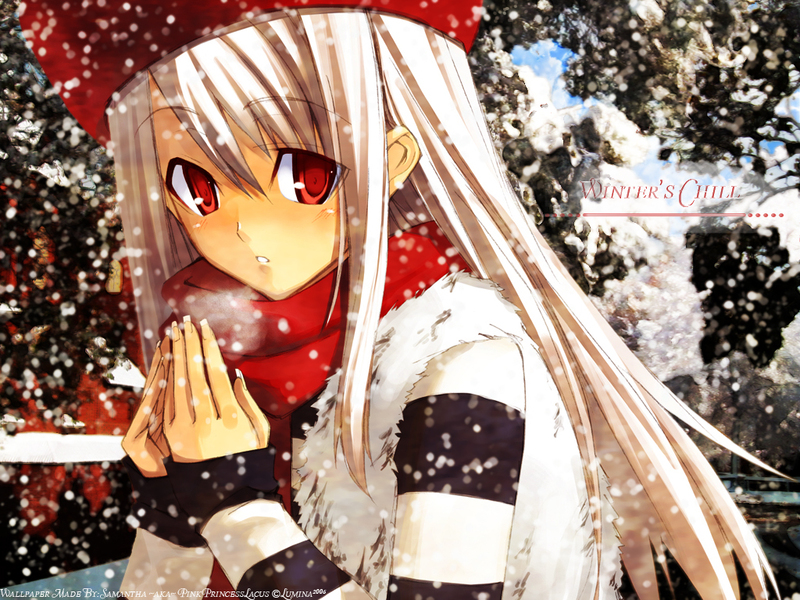 Fate/Zero Wallpaper: Winter's Chill . :[Dedicated to: Heartfulskies]:. Minitokyo »	Fate/Zero Wallpapers » Fate/Zero Wallpaper: Winter's Chill . :[Dedicated to: Heartfulskies]:. Its been awhile since I used a Stock photo so I missed it, and wanted somin more easily done. Oh boy was I wrong -_-, this took like what three days >.< of trying to get it right. First her scan had yellow on it, so I had to paint over those parts to fix it lol. It then took over 7 filtered/blended/color changed layers on two stocks each. I then made the sky in the background, by getting a stock photo of clouds and turning it into a brush and made the sky with a blend mode also on it as well. I also made the snow, the snow was made by getting a regular soft brush and changing the brush settings alot around, I then put filters on the snow to give it a more matching scan look. I then on top added a texture on it above to add to the colors, but the texture was to ruff so I filtered it, it gives the scan and bg a more stroked look to it. So it did take alot of work, more than I would have wanted lol, but I love how it all fits together so wonderfully with the colors matching so nicely I think it just draws you in, I really wanted a winter wall this year I've waited ages to make something with this cute scan. I did the text a cool way to I think, I duplicated the text layer and changed it white and put effects and filters on it to give the text a snowy look as well. I hope this wallie is okay, I tried :D.
Thanks to my twin sister thingperson for her help, and my friends ChopperDave aka Chipmunk Dave, and Kaisui Tatsu aka Vicki, and my Triplet Rhondi! They were so sweet to me and alot of help, I bothered them so much ^_^' but I love them lol. Thankyou all who gave me such great support of my previous wallies and espically my painted ones I tried so hard, thankyou so much I hope all your wishes for the new year come true, you all deserve the best! Good job! I love the feel of the wallpaper, and the snow flakes really help to bring it out! OH my gosh i love this so much i love the scan of her she is so pretty and i love the background and the snow..oh this is so pretty your so talented..*smiles*..i love this so much..*smiles*. The background seems a bit chaotic, like, I dunno what it is. The scan is neatly extracted and I like the snow flakes. Nicely done! Quote by Chloe-chanThe background seems a bit chaotic, like, I dunno what it is. The snow flakes are lovely! Really nice work there!